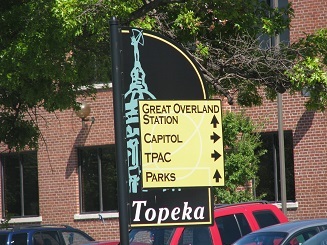 TOPEKA, Kansas - Members of the public and representatives of top Topeka attractions are encouraged to join Visit Topeka in determining the best design and placement of new Topeka wayfinding signs. The discussion is planned for 6:30 p.m. on Wednesday, March 2, at the Big Gage Shelter House in Gage Park. "We want to hear from community partners whose attractions will be affected by the wayfinding system as we develop this important tool for our community," said Brett Oetting, president and CEO of Visit Topeka Inc. "We also want to hear from Topekans who want their city to be the best it can be." Updating wayfinding throughout Topeka means modifications or additions to everything from arrival gateways and vehicular guide signs to pedestrian guide signs, facility identity signs and informational kiosks. Regulatory signs also are included. At the March 2 meeting, project consultants will explain their recommendations for the community regarding the development of a comprehensive wayfinding system for Topeka. Wayfinding improvements will enhance the visitor experience and increase community pride. Like any tool, its purpose, goals and focus must be carefully defined to provide a benefit to the city. "We will use community feedback to take the sign design and wayfinding project to the next step," said Michael Haug, senior project designer with AXIA Creative, the consultant working with Visit Topeka and the City of Topeka on the wayfinding effort. An AXIA team visited Topeka in August to hear from community members. As Topeka&apos;s official destination marketing organization, Visit Topeka Inc. is dedicated to improving the area economy through marketing the region as an exceptional destination for meetings, events, sports and leisure tourism. Visit Topeka Inc. is committed to advocating for community development that will attract new visitors and enhance the community&apos;s quality of life. Go to VisitTopeka.com for more information.